Perfect to use as a Partition Screen or privacy screen. Contemporary style. Accessorize any room in your home. Made from mango wood and MDF. Cappuccino finish. Assembly required. 20 in. W x 72 in. H. At a beautiful touch to your living space with this folding screen. Place it in your bedroom or living room, as a divider or simple accent piece. It is a definite eye-catcher. 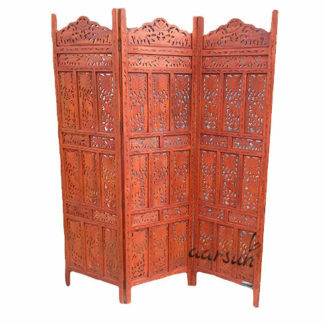 If you also like other wooden Room Dividers , have a look at Traditional Wooden Partition Screens,also in case you require fine carving in sheesham wood, go for Handmade Sheesham Wooden Partition Screen.